When your cake needs a butter frosting, try this delicious American-style Confectioners' Frosting. It is quick to make and easy to use. You can spread it thick, spread it thin, pipe it, and color it. As its name implies, Confectioners' Frosting is made with confectioners sugar (also known as icing or powdered sugar) along with butter, vanilla extract, and milk. It has a wonderfully light and fluffy texture with a sweet and buttery flavor. It is a great all purpose frosting that you can use to fill and frost butter cakes, cupcakes, chiffon cakes, American-style sponge cakes, and even butter cookies. It can be held at room temperature which makes it particularly well suited for baking that shouldn't be refrigerated. Confectioners Frosting is also known as Vanilla Frosting, Butter Frosting, and Buttercream. It is not what you would call a real buttercream, that is, one that is made with eggs and a sugar syrup. As I have said above, Confectioners Frosting contains just confectioners sugar, butter, vanilla extract, and a little milk. Its light and fluffy texture comes from beating these ingredients together for a long time (about five minutes). The end result is a frosting with a nice spreading consistency. You do not want it too thick or it will tear the cake, or too thin as it will run. So if you have to, adjust the milk and/or sugar until it is just right. Like most frostings, Confectioners Frosting is at its best when used right away but it can be stored for later use (in the refrigerator). When you need it, just bring it to room temperature and beat until it returns to its light and fluffy texture. If you find the frosting is too thick, add a little milk. Now, one of the great things about this frosting is that it colors so nicely. My preference is the gel pastes sold in small jars, which can be found at cake decorating store and Michaels. You can use this frosting two ways, either by simply spreading it on your baking using a knife or offset spatula, or you can use a piping bag fitted with a decorating tip (I like to use Wilton 1M open or closed star tips). Once your baked good has been frosted it does need to be covered as the frosting will become hard and crusty over time. Confectioners Frosting: In the bowl of your electric mixer, or with a hand mixer, beat the butter until smooth and well blended. Beat in the vanilla extract. With the mixer on low speed, gradually beat in the sugar. Scrape down the sides of the bowl as needed. Add the milk and beat to combine. Then, on high speed, beat frosting until it is light and fluffy (about 5 minutes). If not using right away, cover with plastic wrap to prevent the frosting from drying out. 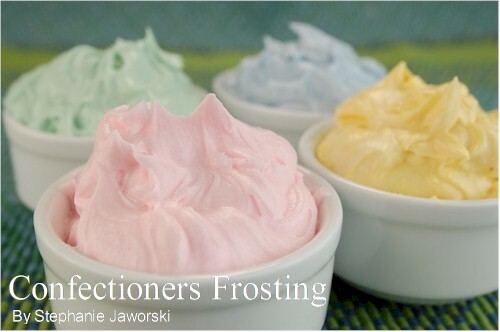 This frosting can be stored in the refrigerator for up to 10 days. Bring to room temperature and re-whip before using. Add a little milk or sugar if needed to get the right consistency. Tint portions of frosting with desired food color (I use the gel paste food coloring that is available at cake decorating stores and party stores). To make a Chocolate Frosting prepare the above recipe but beat into finished frosting, four ounces (120 grams) of melted and cooled unsweetened chocolate. Add a little extra milk if needed. This recipe makes enough to fill and frost one 8- or 9- inch (20 - 23 cm) cake. Note: For a softer and fluffier frosting use a combination of 1/2 cup (113 grams) unsalted butter and 1/2 cup (113 grams) shortening. Malouf, Tarek & the Hummingbird Bakers. The Hummingbird Bakery Cookbook. Ryland Peters & Small. New York: 2009. Purdy, Susan. A Piece of Cake. Collier Books. New York: 1989. Rombauer, Irma S., Rombauer Becker, Marion, & Becker, Ethan. The All New All Purpose Joy of Cooking. Scribner. New York: 1997. Walter, Carole. Great Cakes. Ballantine Books. New York: 1991.